Join us on May 31st as we dance the night away to some of Whitney’s classic hits including I Wanna Dance With Somebody, Saving All My Love for You, The Greatest Love Of All and of course the timeless smash hit I Will Always Love You. Micki has based her show to emulate the queen of the night and has an uncanny likeness to Whitney both vocally and physically to create a show that is unforgettable from start to finish which is why it’s a must see for any Whitney fan. If your looking to relive the late 80’s, look no further as this is going to truly be a night to remember! 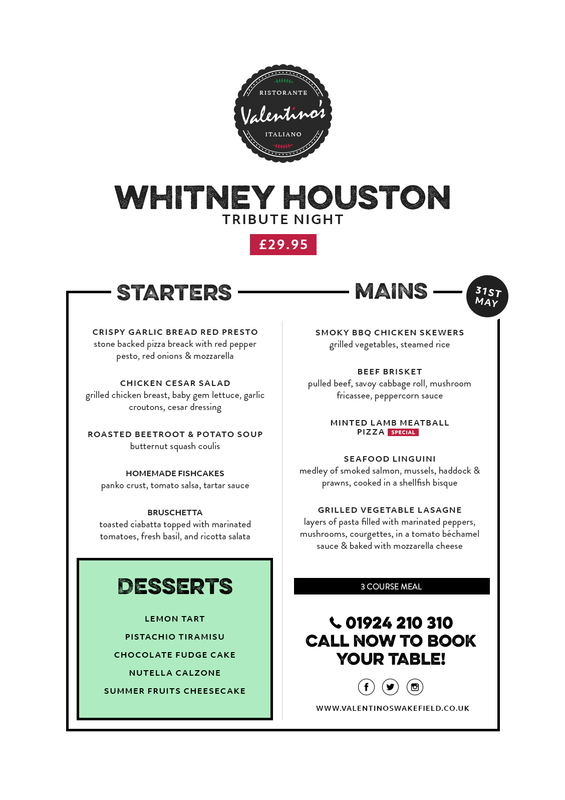 As always with our tribute nights your ticket includes a stunning 3 course meal cooked to perfection by our head chef and because its Thursday that means it’s also 2 for 1 cocktails all night. So enjoy your 3-course dinner and then get into party mode and onto the dance floor at 7:30pm.